Openlands foresters plant between 300 and 500 trees around the city every year. 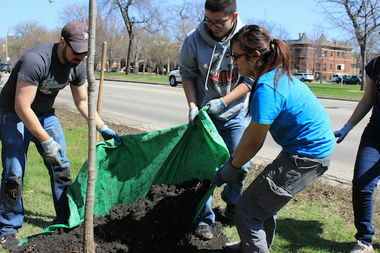 CHICAGO — The city's leafiest neighborhood is about to get even greener, as at least 30 new trees will be planted in Edgebrook this spring, the nonprofit forestry group Openlands announced. The trees are coming courtesy of the Openlands' TreePlanters Grants, which accept new applications from city and suburban residents every spring and fall. This year, Edgebrook resident Lidia Pomaville was among the winners, she said. When the grant application process was announced in January, Pomaville gathered more than 20 of her neighbors and encouraged them to make a bid. Many trees in the area — especially near in Pomaville's home in the 6700 block of North Iona Avenue — have been decimated by ash borer disease, she said. With 44 percent of Forest Glen already under tree canopy, the neighborhood is by far the leafiest of Chicago's 77 community areas, according to a study released last year. So with at least seven trees having died on Pomaville's block since she moved there in 2014, she was eager to bring some plant life back to her neighborhood, she said. "Being No. 1 in tree canopy is why a lot of people move here, including me," she said. "So when trees go missing, people really start to notice." Openlands staffers will meet with neighbors in the next several months and teach them how to plant and care for the new trees, Pomaville said. They'll include a wide array of plant species, so as to safeguard against disease. Foresters often tout the broad rewards of greening urban spaces, from cleaning the air to improving storm drainage. But they can help save neighbors money too, said Daniella Pereira, Openlands' director of regional forestry. "The shade they provide helps reduce heat, which gets otherwise gets absorbed into impervious surfaces" like concrete in the summer, she said. "That reduces the amount of energy homes end up having to use." Studies have even suggested that greener blocks see less crime, because they're a sign of community upkeep and "more eyes on the street," Pereira said. Openlands plants between 300 and 500 trees around the city every year.